Stop waiting for the website visitors to click on the LiveChat button. Start proactively reaching out to them and personally engage your website visitors. From time to time I watch the traffic on our website and select particular visitors to chat with me. I use the feature called ‘Personal Invite’, which is available when you click right mouse button on any website visitor. This feature gives you the ability to enter a custom message that will be displayed on the visitor’s screen along with your name and picture. 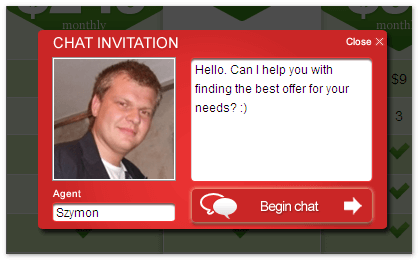 Using the Personal Chat Invitation (as shown above) maximizes the chance of having your invitation accepted by the website visitors and starting the chat session with you. We’ve done some tests to find out what the real power of the “personal” approach really is. Take a look at the results of the test we’ve made. The classic chat invitation was displayed 9036 times on the entire website and it ended up on 610 chat sessions. The overall conversion from the standard invitation to chat was 6,75%. In comparison, the chat invitation with personal message was displayed only 3951 times and it was targeted mostly to the visitors browsing pages with prices and plans. However, it’s efficiency was much better and it was accepted 681 times, what set the conversion ratio of the personal invitation at the level of 17,24%! 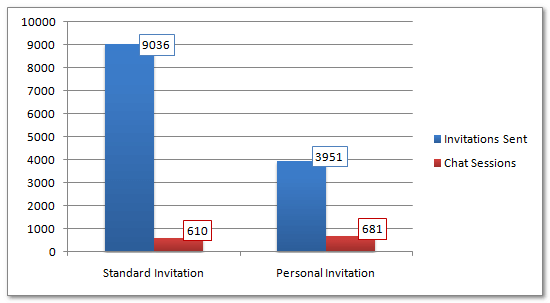 This means the personal invitation was 2,5 times more efficient than the regular chat invitation! As the examples above show, the proper selection of the page where the invitation is being displayed, selection of the visitors and customizing the invitation so it matches the visitors’ expectations, can bring a lot more value than just sending automated invitations to all website visitors. Carefully define the group of visitors you want to reach out to — observe the visitors activities, especially in order and pre-order pages. You want to display the invitation to the best prospects to help them buy your products, not to the people who just chat and end up leaving your pages without ordering anything. If possible, address your visitors personally — it works for visitors, who already chatted with you or any other operator. Addressing them by their names dramatically increases a chance for start of new conversation. Customize the chat invitation — make it look like an internal part of your website. – Hi! We have several types of “searched keyword”, would you like to chat more about it? – I see that “referrer” pointed our page as a right place to find what you need. Would you like me to help you? Test different graphics and displayed messages — keep improving your invitations, be original and make them interesting to catch your visitors’ attention. Getting your sales team a tool like LiveChat should be treated as an investment. You want it to pay for itself as soon as possible, but need to remember that just equipping your salesforce with live chat software will not make them sell more automatically. To profit from live chat software, make sure you select the right tool for your needs and set it up properly so it really gets the job done for your business.